Hundreds of years ago, a king of an Asian country who lived in a port city, received a visit from a king of adjacent country, his friend. The visitor brought a present with him. It was an elephant. The visitor gave it and said, "Can you measure the elephant's rough weight in a day?" The king of the port city consulted with the retainers. "We just have beam scales weighing bags. Do you have any ideas?" One vassal said, "I can make the relevant measuring equipment assembling large levers and pulleys, your majesty." "Can you make it in a day?" 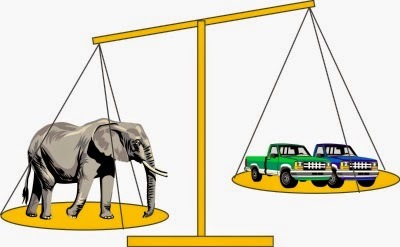 Another vassal said, "How about weighing in pieces after killing the elephant?" At last they found the method and measured the elephant's approximate weight without sophisticated devices. Load the elephant onto a boat large enough to carry it. The boat will sink slightly, and you mark the level of the water on the side of the boat. Then you offload the elephant and fill the boat with bags until the boat sinks to the level marked. The bags can be individually weighed using beam scales and the weight of the elephant is the sum of the weight of the bags. This puzzle is slightly cunning in that it the geographic location of the city is a small clue.